A Large Wedding Cake on a Not-so-Big Budget? I had the honour of making Dawn and Eric’s wedding cake the other day. I can only describe Eric as being a cake connoisseur – Eric just loves cake! With this in mind they really wanted a lot of cake at their wedding but their budget didn’t quite stretch as far as it would have needed to cost, to have the amount of wedding cake they wanted. So, what I made for them was a large 4 tier iced cake with a real bottom tier and 3 dummy tiers on top, then I also made 3 square cutting cakes for their caterers to cut up and serve with the main cake. These weren’t iced, therefore saving lots of time and money but bringing the total amount of portions to over 200! Having dummy tiers and cutting cakes is a great way of having a large centre piece for your wedding without it completely smashing your cake budget. If they had had 200 portions in the main cake itself it would have probably doubled the actual price they paid, so really good advice for you if you’re after a real showpiece on a relatively small budget. 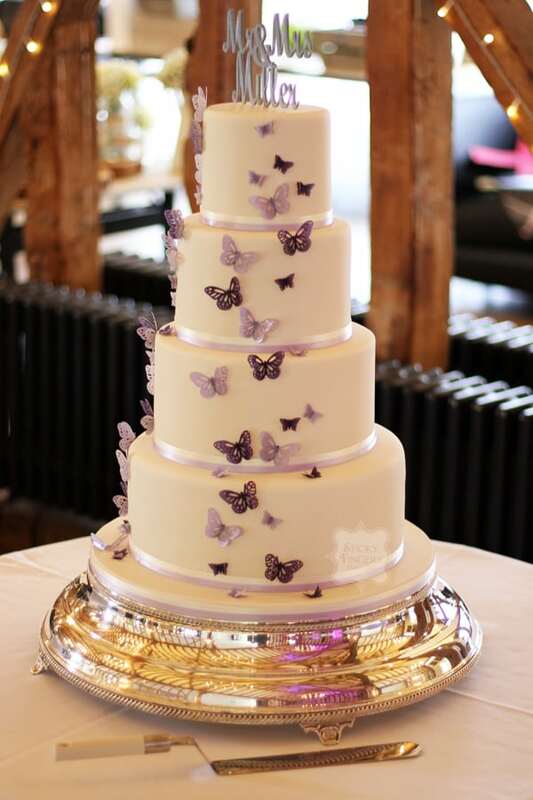 “To think when we first met at the wedding fair, I went in there with no intention of talking to anybody about cakes as we’d already spoken to so many. The temptation of the lovely lemony lemon cake was all too much and I couldn’t resist a sample. Delicious is an understatement. For Eric to say such kind words really made my day and I was so happy I was able to help them when it came to (obviously!) such an important part of their big day. Thanks guys.